Online credit applicants can fool you with any number of tricks to get their fraudulent or stolen identities approved and confirmed for credit, while leaving you holding the bag for losses. Instead of verifying and re-verifying ID information of fraudulent applicants, consider this: Verifying the reputation of the device (or computer) being used to submit the application. When a fraudster connects to your business, the computer being used can be instantly evaluated for its criminal history. If you know the device has a fraud history, the detail of checking ID specifics is supplemental. You don't have to spend time, resources, and money checking ID information - you know the source is suspect and you can block the transaction immediately. 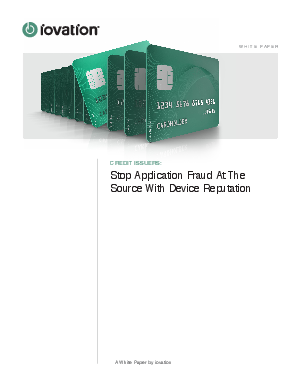 Device fingerprinting coupled with the device's reputation helps identify the bad guys in the acquisition channel, so you don't have to rely on other fraud detection tools that drive up the cost to decision an application.